You can now complete the Diving hobby and add pools to your gardens! Click here to find out how! Is the prize worth it? Its nice to have but once you unlock the teen mansion you get a volleyball net in the pool anyway! Where can I find it? In the pool items tab of the outdoor section. Can I complete this quest even though I have passed level 13? Can I build the swim center before starting this quest? The Sims Freeplay- Killing Off Sims: Who Asked For That?! 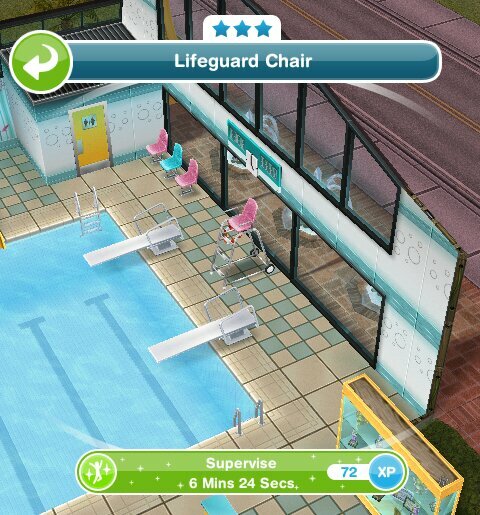 Wait, how long does supervising in a lifeguard chair take? I didn’t see the time duration in your post Thanks. 😄😃😀 BTW, this blog is so helpful! Can you start the ‘using the slide’ quests early? it says in the post, 6 days. Dose the volleyball net cost love or simolens? Thanks. I’ve seen a toddler slide in pics on the sims freeplay on Facebook where can I find this item?? go to the stable and click to finish building one of the arenas. Heyy hiii..Just had a question to ask regarding this quest . The time limit for my quest is showing only 2 days while in your post it’s mentioned 6 days. Do you know the reason behind this?? Thank u for your great help. Heyyyy hii..thank you so much for your great help. Just to bring to your notice that the timings of the above quest has changed so hereby posting the new changes. Hi, I do enjoy your posts. It helps me schedule my game and live my life! I am starting again and wanted to let you know there’s some changes to this quest. Time limit is less than two days, I think. It took 12& 1/2 hours to build the swim center, now I’m staring at pool slide for 10& 1/2 hours. If they left getting advice for one day, I’m sunk. 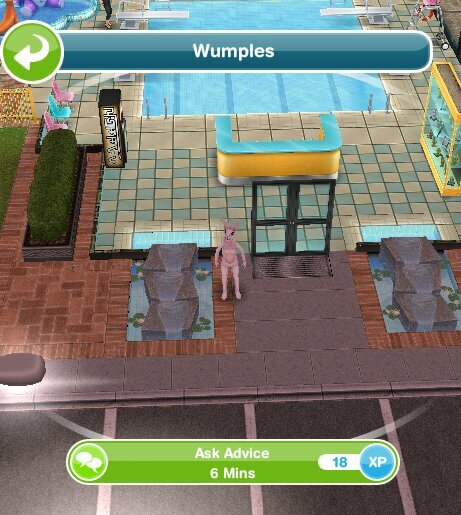 Looking at diving board apprehensively was cut to one minute and first time asking Wupples for advice is 6 minutes, 24 seconds. I don’t know about the rest. I do differ on the value of a couple properties, though. Vacant lot isn’t worth it, I believe. The sanctuary is better because of all the trees. Also, cedar siding is nice. Connect the rooms together and it makes a real nice house. I added a second story to my old town and it makes for an impressive home. The beach house has nice furniture in the main house and can be remodeled as needed. Plus that luxury car is worth it. I noticed the car doesn’t make LPs like it did a year ago. I have a query. You mentioned that I could still get a volleyball net in the teen mansion (after unlocking it). So if I don’t complete the quest in time, but as long as I unlock the teen mansion, am I able to place the volleyball net (from the teen mansion) in my other houses? I put some of the furniture from the new house that I bought into my inventory, then after when i went into the inventory all the stuff was completely gone! You aren’t the only one who has had this problem, it appears to be a glitch, I think you should contact EA to see if they can fix this for you as I am unable to fix technical issues, sorry! Thank you for this helpful website you made.One question!How many people you mast have it to build the Swimming Center? Personally I would just but an empty plot because I like designing my own houses but the renovators dream is good if you just want to decorate instead of design yourself and it probably would be cheaper even though SPs but all the rooms and pool are already there. Thanks 🙂 I’m glad it helps! I used to have this game, and somehow lost all my progress. Every quest I did was version one, but now they are all version two. Do you know why that would be? This is because they have updated the game on your device to be the latest version which is version 2, some devices still have the old version as the changes haven’t been rolled out across all devices yet. Is there a way for the sims to put on swimsuits for the it’s all going swimmingly quest or at all. Is there any way that you can delete comments? I commented a while ago about needing a neighbor with a swim center and now I receive daily Game Center friend requests and it’s getting really obnoxious. Hey there, just wanted to say that your blog is really god sent! By the way, I was wondering if anyone else has the same problem I’m facing now. I’d previously completed this quest (last year) and bought a piece of swimwear which is still in my wardrobe. I would now like to buy different ones but can’t seem to find any other swimwear in the store. Any idea why? Is this due to the recent update? Have you built the costume and swim store to access all the swimwear? Oh dear! How silly of me! And all along I thought that was the costume and swim store cos I’d been changing my sims’ outfits there. Thank you! That isn’t silly at all, at least its all sorted now! How can you earn enough money apart from buying packages? Can I complete this quest even though I am passed level 13? If you are on or past level 13 it will start straight away unfortunately. I completed the quest on time, built a pool in one of the houses and placed the volley net, but cannot have two sims play even if they are both in the pool on opposite sides of the net. 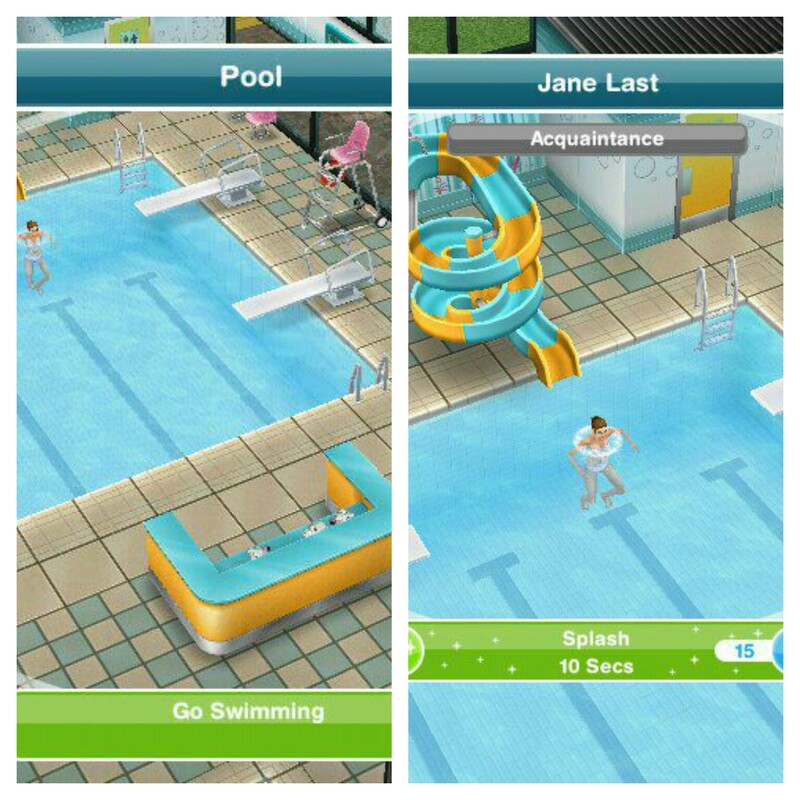 I get a message which says a sim must first invite the second sim for a swim, but I dont get this option when clicking on them. Is the pool too little, maybe? Does a game require a minimum size? Thanks in advance for your help! I am not sure what the problem is, sorry! It may be that your pool is too small but I don’t know for sure. Do you have steps to the pool? 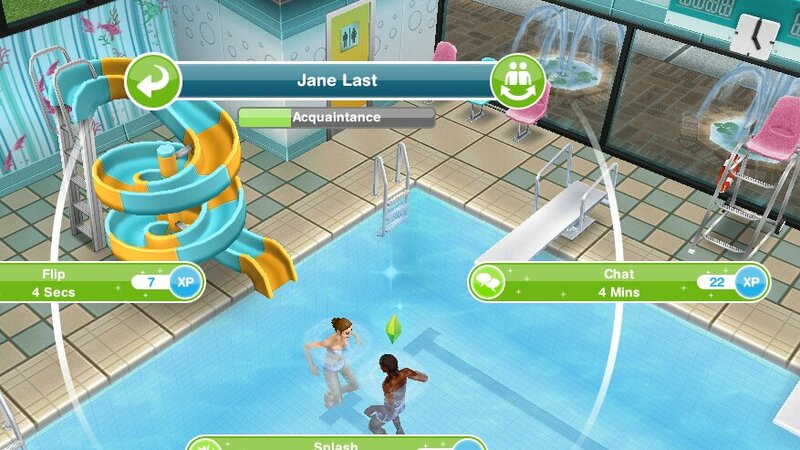 Are both sims in the pool? Hello, thanks for your reply. My pool is 6 squares length x 4 squares width, there are two steps on the short sides. Since the volley net is 4 squares long, I had to place on the longer side, so that there is one single row of space on one side of it, two rows on the opposite side. Is this okay, or it’s since the pool is too little? Maybe you need two rows on either to be able to have a game? I would only be guessing but I can’t think of another reason why it wouldn’t work, sorry! I can’t afford the swim center. How can I get in app purchases? 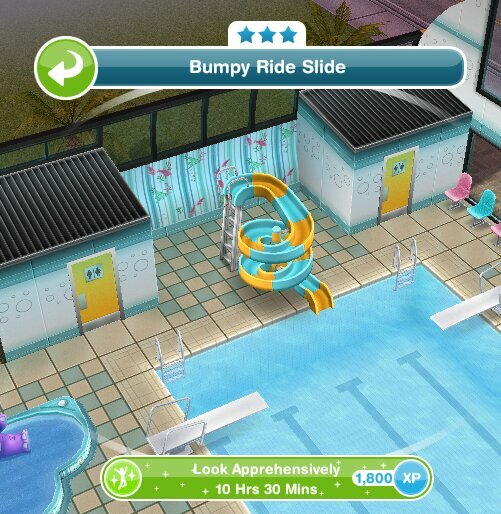 You can access in app purchases through the purple shopping cart symbol as explained in this post: https://thegirlwhogames.wordpress.com/2014/08/30/the-sims-freeplay-online-store/ but I would recommend giving the other post about how to earn money a read first as it is possible to earn money without buying it. Swimming costumes can be found in the store once you have built the costume and swim store. Yes they can swim and once you complete this quest and build the costume and sim store you will be able to find swimming costumes for them. I am doing the quest, and I don’t have a pool, will I get a pool when the quest is complete? You have to complete the quest first and then you can build pools in your gardens. 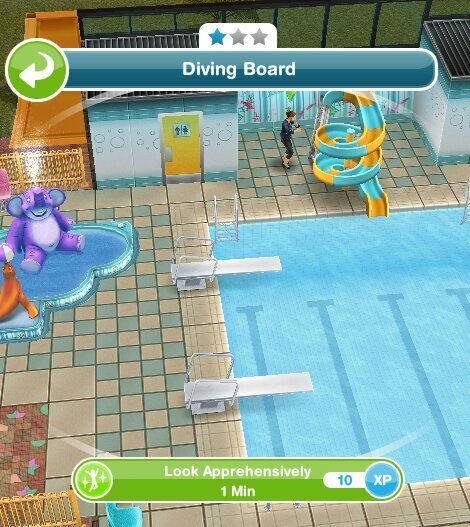 A toddler can go into a pool but you need a teenage sim or above in the pool and then select the option on them using the toddler to play in the pool, they just bounce them about for a few seconds. I’m just a bit confused about the limited time prize. Because in the game it says I will get the volleyball net if I complete the quest before time limit. And here you mentioned that I will get the volleyball pool set as the limited time prize! So which one of them is actually the limited time prize? And when you say volleyball pool set, is it bought by simoleons or real money from store? 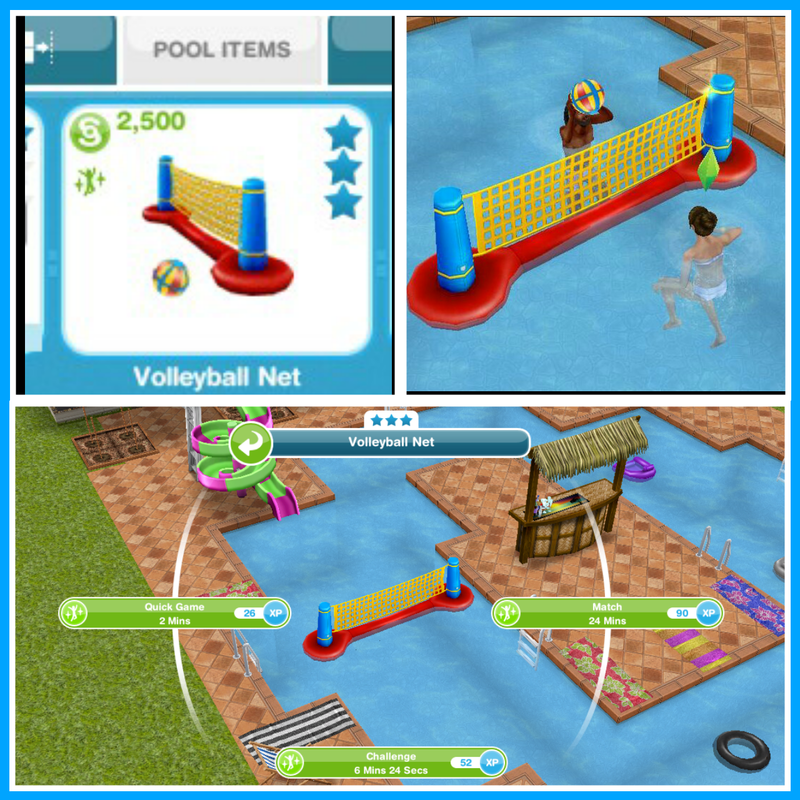 The vollyball net is the time limited prize, you unlock the ability to build pools and pool items by completing the quest even if you don’t finish in the time limit. But you can find a vollyball net in the teen idol house once you unlock that but it’s only one net, you cannot buy anymore if you don’t complete this one in time. How do you combine pools like you have in the last picture? 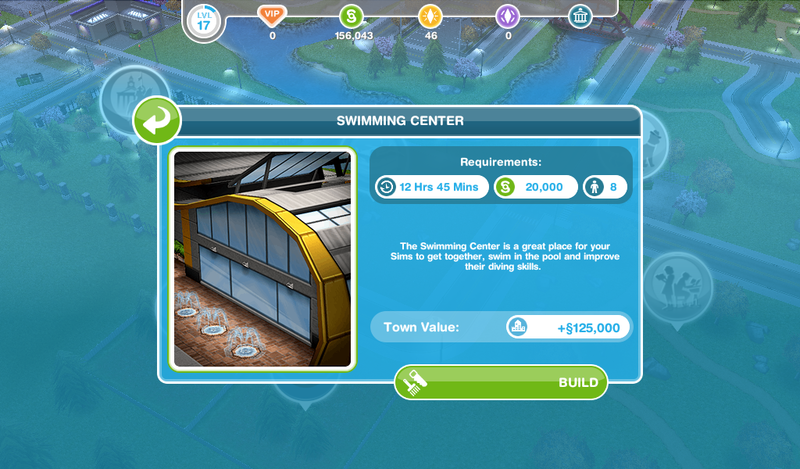 I wish the swim center only costs 20k! Mine is 100k! I had to forgo the special gift because I didn’t have nearly enough simoleons to pay for it. At this point, I’m just not completing any quests, and only making money. If I don’t finish it on time, what will I get? 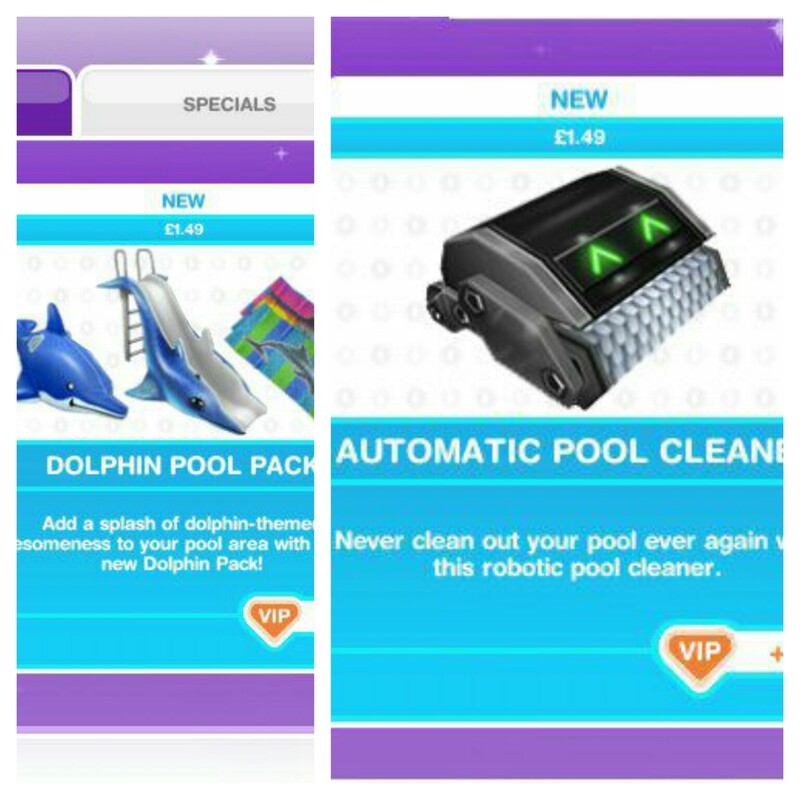 Swimming pool stuff be unlocked, but not free / get nothing? You will still unlock the swim center and swimming pools, the only thing you don’t get if you don’t complete in the time limit is the volleyball set.